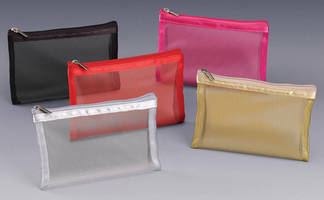 Nylon mesh pouchesÂ with metal zipper closure come in 5 colors: red (PartÂ No. 59923), black (PartÂ No. 59924), pink (PartÂ No. 59925), silver (PartÂ No. 59926), and gold (PartÂ No. 59927). Measuring 6.5 x 4 in., each pouch is suited for packaging samples, creating promotional giveaways, and retail sale. Private labelling/branding options are available. Edgewood, NY – Qosmedix has launched a new collection of nylon mesh pouches that include a convenient metal zipper closure. Available in five bold colors including Red (Part # 59923), Black (Part # 59924), Pink (Part # 59925), Silver (Part # 59926) and Gold (Part # 59927). These useful mesh pouches are ideal for packaging samples, creating promotional giveaways, and retail sale. Visit www.qosmedix.com to place an order or to learn more about how to private label these items for your brand.